The Chicago Auto Show has been gaining in importance for the last several years, and many automakers now use the show to announce special editions and even unveil brand new models. It’s a good way to get a little more attention for deserving cars and trucks that might be overshadowed at the massive North American International Auto Show in Detroit. 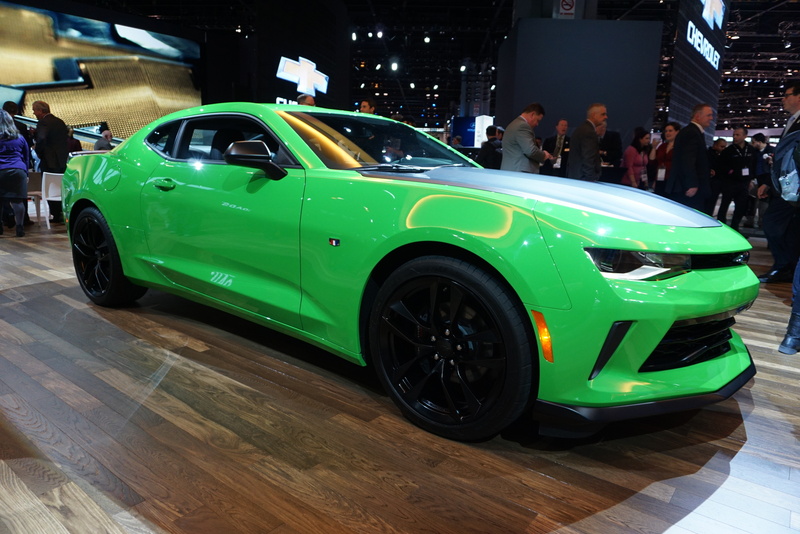 We spent the day doing the Auto Show Shuffle to each and every press conference in Chicago’s mighty McCormick Plaza convention center, and we’ve assembled our favorites from the day for your edutainment pleasure. Kia has been on a juggernaut of great cars for several years, and all indications are that this momentum is just getting started. Today the Korean-American automaker presented a revised 2017 Kia Optima Hybrid, and announced a new 2017 Kia Optima Plug-In Hybrid (PHEV). Both cars will be on sale later this year. Kia noted a host of new technologies and features in the Kia Optima PHEV, including a more powerful hybrid engine, a smarter and more robust telematics system, exterior design enhancements, and greater interior refinement. 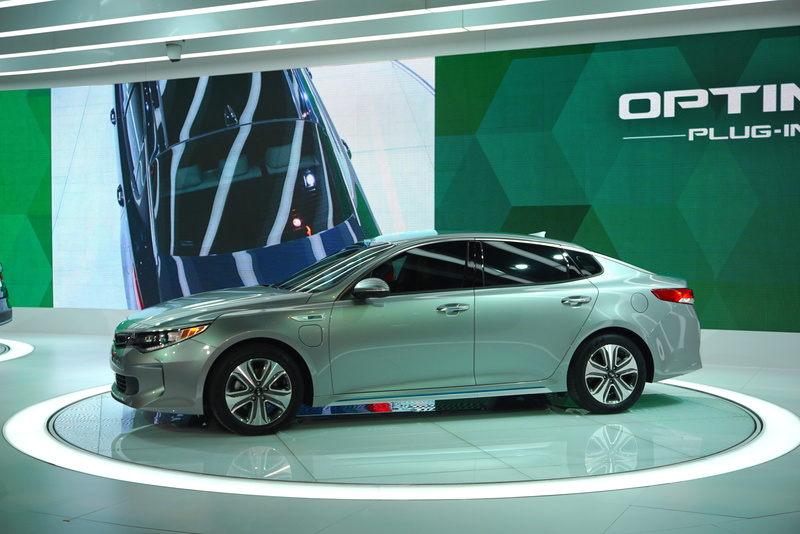 The Optima Hybrid will be powered by a 2.0-liter GDI four cylinder – estimated at 154 horsepower – coupled with a hybrid starter generator and tied to an upgraded, smooth-shifting six-speed automatic transmission. A 38 kW electric motor and clutch replaces the traditional torque converter to provide strong off-the-line acceleration and power assistance to the engine when necessary. Energy flow is fast and seamless between EV mode and hybrid mode. Total combined output for the Optima Hybrid is estimated at a robust 193 horsepower at 6,000 rpm. But wait! The Optima PHEV will also give you up to 27 miles of all-EV driving capability, and an overall range of up to 600 miles on a tank of fuel. Plus a little more horsepower than the Optima Hybrid due to the larger electric motor. Good stuff all around! 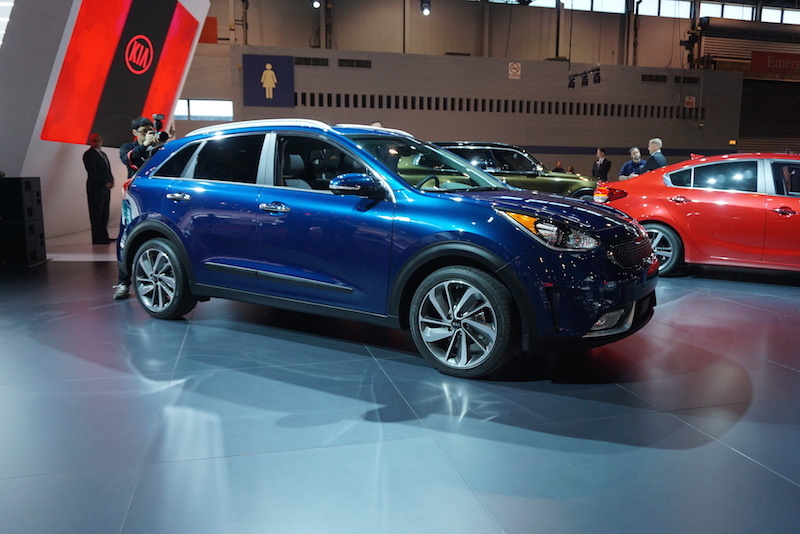 Kia’s other big news was the debut of the Niro Hybrid Utility Vehicle. This is a compact crossover SUV about the size of Kia’s popular Sportage, but equipped with a hybrid drivetrain featuring an all-new, state-of-the-art Kappa 1.6-liter GDI four-cylinder engine, engineered specifically for hybrid applications. Making 103 horsepower, the new engine marks the first combination of the Atkinson Cycle, cooled exhaust gas recirculation (EGR), GDI and a long-stroke-narrow-bore specification to maximize efficiency2. Efficiency and emissions are further improved via the Niro’s exhaust heat recovery system, which speeds engine warm-up by routing coolant to a heat exchanger in the exhaust system. A 43-hp tractive motor, known as the transmission-mounted electric device (TMED), works in tandem with the gasoline engine to produce a robust 146 horsepower and 195 lb.-ft. of torque. That power is transmitted through a newly developed, second-generation six-speed dual-clutch transmission (DCT), which Kia has thankfully adopted instead of a continuously variable unit. F iat-Chrysler’s Ram truck division announced that the Power Wagon is coming back, and showed off a truly handsome off-road design for the truck. 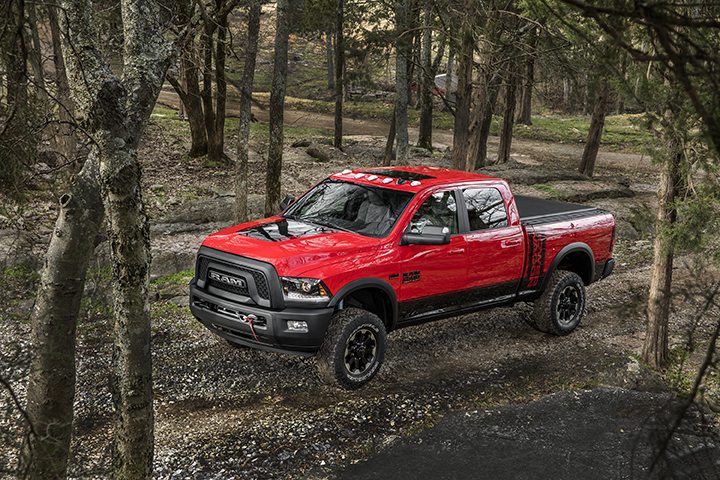 Based on the Ram 2500 Heavy Duty 4×4 Crew Cab, the Power Wagon features a number of off-road-specific enhancements, including a unique suspension with more than two inches of lift, locking differentials and a 12,000-lb. winch, giving this beast a significant advantage over all production pickups. The 2017 Ram Power Wagon also includes a best-in-class 410 horsepower, 6.4-liter HEMI V-8 engine. The engine calibration is unique to Power Wagon to enhance its off-road maneuverability and finesse. When driving in four-wheel-drive “Low,” the throttle response softens and the idle speed increases by 100 rpm (from 650 to 750 rpm) – providing added control when ascending and descending off-road obstacles at slow speeds. Efficiency is a hallmark of the 6.4-liter HEMI V-8, starting with the company’s Fuel Saver cylinder-deactivation technology. When conditions allow, as in highway cruising, the system seamlessly shuts down four cylinders to conserve fuel. The engine features an active dual-runner-length intake manifold optimized specifically for the Ram Heavy Duty lineup. The result is improved low-end torque without sacrificing high-end power. 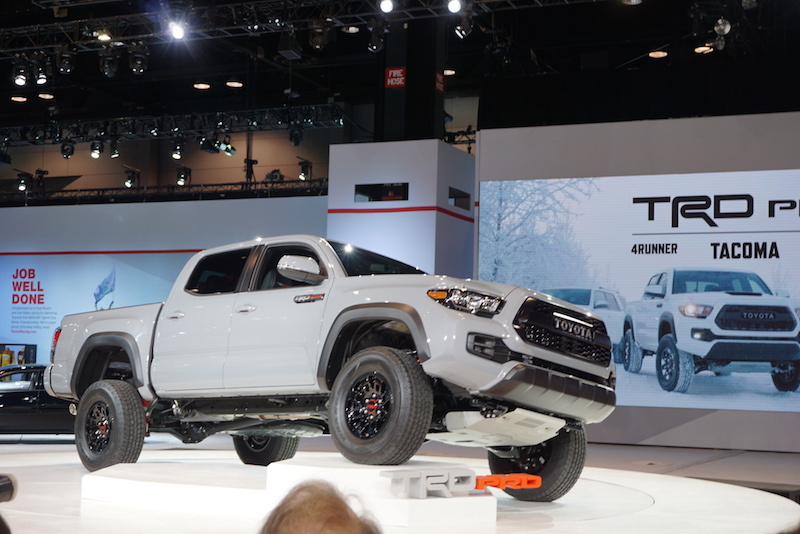 Never to be pushed aside, Toyota also announced a new TRD Pro off-road version of the mid-sized Toyota Tacoma. Coming off a string of awards for the Tacoma and the related 4Runner SUV, Toyota has given the TRD Pro truck all the bells and whistles to make it a great contender. The new truck features the most high-performance off-road suspension system ever to be offered on a Toyota production vehicle, including 2.5-inch Fox front coil-overs paired with TRD springs, rasing the ride height by an inch. In back, Fox 2.5-inch shocks with remote reservoirs are paired with TRD leaf springs. Of course, the Tacoma TRD Pro has four-wheel drive with an Auto limited slip device, crawl control and Multi-Terrain Select, locking rear diff, and a big thick aluminum skid plate under the front end. The Tacoma TRD Pro comes in a crew cab as the only body option. 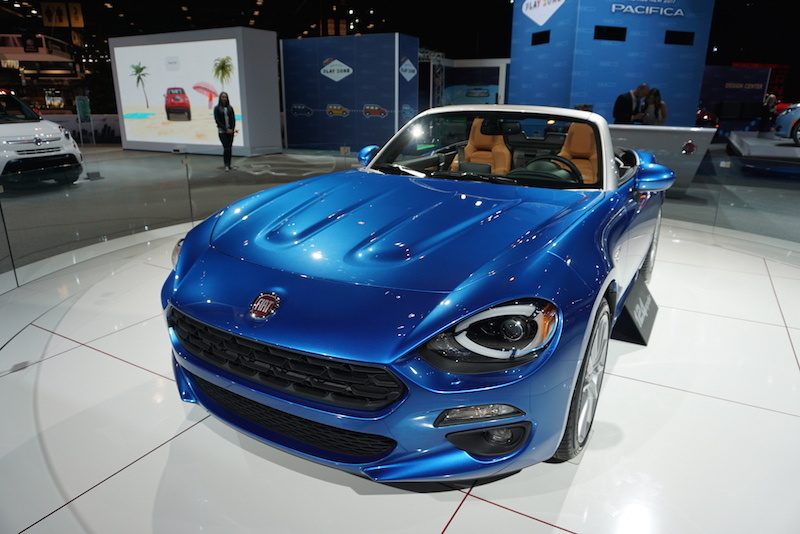 Fiat has the 124 Spider unveiled last November in Los Angeles on display, and it’s much easier to take a good look. Fiat has also confirmed with Test Miles that the production 124 Spider will feature the 1.4-liter turbocharged Multi-Air engine rated at 160 horsepower and 184 lb.-ft. of torque, equipped with manual or automatic transmission. The 124 Spider’s suspension uses a double-wishbone layout in front and a multi-link in the rear, specifically tuned for greater stability while braking and turning. Steering is light and responsive with the use of an electric power assist (dual pinion) system. The steering and suspension setup, lightweight frame, balanced weight distribution and turbocharged engine combine for a dynamic driving experience. Noise vibration and harshness (NVH) enhancements, including an acoustic front windshield and insulation treatments, also help to deliver a refined, quiet ride. For an open-air driving experience, the Fiat 124 Spider’s soft convertible top is easy to operate and requires minimal force, much like the original Spider’s top. The new Fiat 124 spider is expected to go on sale later this year. The last good news in a day full of great cars was that Chevy is putting its popular 1LE package onto the V6-powered Camaro. The 3.6-liter V6 in question makes a heady 335 horsepower, so it’s roughly comparable to the top V8 engines of 10 years ago, and is available with a 6-speed manual transmission. Now for the first time, the 1LE package will be available on V6 Camaro coupes at both the base 1LT or luxury 2LT trim levels. Featuring more aggressive suspension tuning, standard Brembo brakes and Goodyear Eagle F1 tires, the LT 1LE delivers an estimated 0.97G in cornering grip. Available Recaro seats will keep you planted through the corners, and an available Performance Data Recorder will allow you to view and share your track experience. Of course, for the V-8-powered cars, there’s a new 1LE package for Camaro 1SS models that includes magnetic ride control with a new FE4 suspension tuning and a new, segment-exclusive electronic limited slip differential (eLSD). Paired with massive Goodyear Eagle F1 tires, lateral acceleration will exceed 1G. Additional features available on the 1LE package include standard Recaro seats and a Performance Data Recorder (PDR), new to the Camaro lineup. We’ll be back tomorrow with more news, so stay tuned. Mercedes has added a contractor’s special model to its popular Sprinter line, there’s a mid-cycle refresh coming for the Chevy Trax compact crossover, and Nissan unveiled its new Armada full-size SUV as we reported last night. Jeff Zurschmeide is a freelance automotive journalist from Portland, Oregon.Jeff covers new cars, motor sports, and technical topics for a variety of newspapers, magazines, and online outlets, including Test Miles, The Oregonian newspaper, Sports Car Market magazine, and Digital Trends.Additionally, Jeff is the author of nine published books on automotive topics, including photo histories of Portland International Raceway and Portland Speedway. You can find all of them at amazon.com.